Selective Catalytic Reduction (SCR) is the most effective method of controlling nitrogen oxide emissions (NOx) from combustion sources. It is a commercially proven flue gas treatment technology that has been demonstrated to remove over 90 percent of the NOx contained in combustion or process exhaust gas. Elimination of NOx creates a healthier environment and meets stringent new EPA and EU reduction requirements. SCR technology is widely used on different types of combustion systems such as coal fired boilers, simple and combined cycle gas turbines, process boilers, hydrogen reformers, etc. Virtually any hot flue gas containing NOx can be treated effectively with the SCR process as a retrofit or as new equipment. The catalyst is at the heart of the SCR process. It creates a surface for reacting the NOx and ammonia, and allows for the reaction to occur within typical flue gas temperature ranges. The active ingredient in most NOx catalyst is Vanadium Pentoxide (V2O5) of various concentrations. For higher temperatures zeolites, tungsten or titanium matrices may be utilized as well. 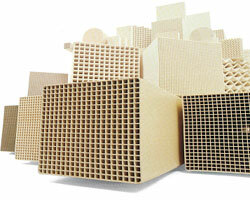 Catalyst configurations can be homogenous honeycomb, coated honeycomb or plate type catalyst. The catalyst opening, composition and volume of catalyst are determined by components of flue gas chemistry, treatment temperature and amount of flue gas to be treated. The Ammonia reducing agent is injected upstream of the catalyst. It is crucial that ammonia be evenly distributed along the face of the catalyst. Usually, it is necessary to ensure that the flue gas flow is even with flow chevrons and mixing devices. 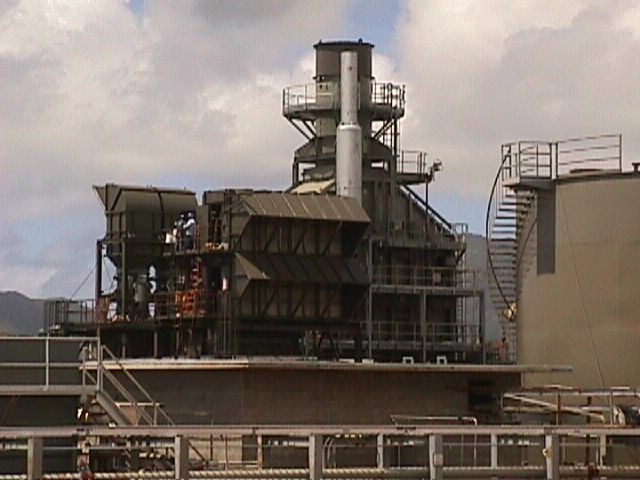 Then, an Ammonia Injection Grid is used to ensure that the ammonia is evenly distributed across the flue gas. As an alternative, urea solutions can be used as a source of ammonia - converted to ammonia either externally or in-situ. The reaction occurs in the pores of the catalyst bank. 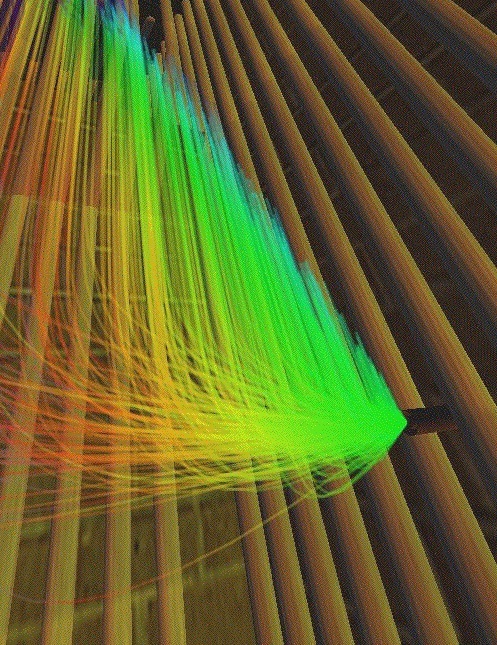 The catalyst bank may consist of one or more layers of catalyst for treatment. On the surface of the catalyst, the NOx will be selectively reduced by reacting with ammonia in the presence of oxygen to form harmless byproducts, water and nitrogen (H2O & N2). Typically the range of temperature for this reaction is 500-850°F (260-454°C). In clean gas applications, specialty high-temperature formulations are able to achieve high NOx reduction at temperatures as high as 1100°F (593°C). This wide temperature range allows for flexibility in a retrofit situation and choices for multi-pollutant optimization in new equipment. Selective Catalytic Reduction may be used in any industry with effluent gas at sufficient temperature containing nitrogen oxides such as Power, Petrochemical, Steel, Metal production, Pulp and Paper, Cement, Waste to Energy, Glass, Nitrous Acid Production etc. It is ideal to meet the EPA's stringent requirements for NOx reduction in any combustion application. Selective Non-Catalytic Reduction (SNCR) is a proven method of controlling nitrogen oxide emissions (NOx) from Incinerators, Industrial Boilers, Utility Boilers, Process Plant Heaters, Paper Mill Recovery Boilers, Cement Kilns, CPI Process Exhausts. The method can use either urea or ammonia and does not require a catalyst. DNT has experience and track record at 30+ units. Can continuously achieve 40-70% NOx reduction in Industrial Applications and is generally considered the most cost effective technique for achieving the first increment of NOx reduction. Installed cost is approximately $5 per kW gross heat input. DNT knows where, how, and how much reagent to inject into your Process. The data proves that DNT's system uses less reagent than the competition's - which also means that ammonia slip is less as well. DNT's design is protected by US and International Patent Law and is covered by a broad Intellectual Property Infringement Defense and Damages Insurance policy. 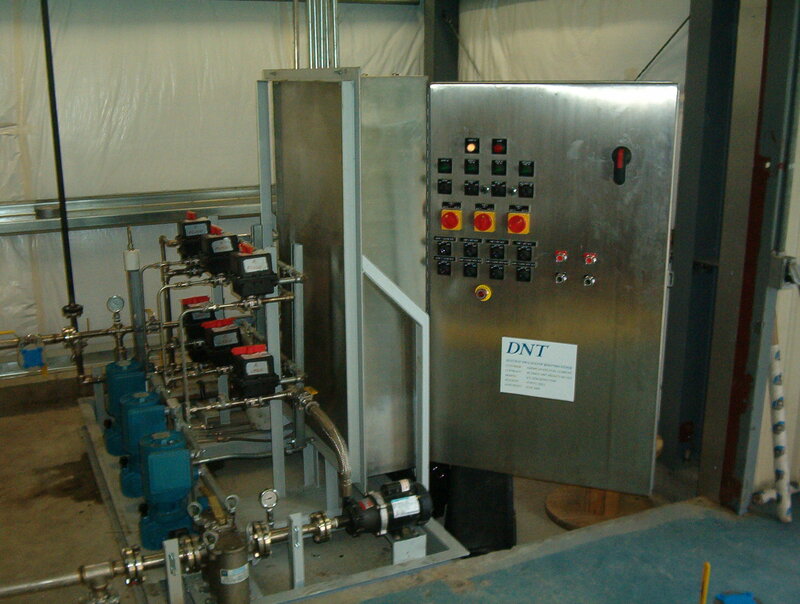 DNT has impressive experience with both ammonia an urea-based systems. DNT's Urea-Based system is Patent-Pending and INSURED. This Intellectual Property Insurance is extended to DNT's customers, listed as Additional Insured, and covers Litigation Expense and Damages. The liquid reagent is received, stored, and processed in "Standard" design modules, prefabricated to the maximum extent possible. Installation is routine and is often managed by Plant or Corporate personnel. Provided with or without the PLC of your choice. Simple and Efficient. The key component is the injection nozzle. DNT's Version 3 is now in operation at several facilities - as part of DNT systems or OEM replacement. The Version 3 injector doesn't clog internally, lasts longer in this brutal environment (ultra-high temperatures with high acid gas/particulate concentrations), and atomizes/distributes the reagent better than the Competition's. Typically the range of temperature for this reaction is 1600-2100°F. 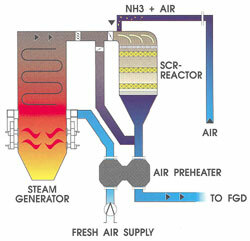 SNCR is an ideal retrofit technology and is compatible with other techniques (i.e., low-NOx burners, OFA, FGR, gas reburning, etc.) as part of a Combination Technology Approach to even higher NOx reduction. Selective Catalytic Reduction may be used in any industry with effluent gas at sufficient temperature and residence time such as Power, Petrochemical, Steel, Metal production, Pulp and Paper, Cement, Waste to Energy, Glass, Nitrous Acid Production etc. ●External conversion of urea to ammonia gas for delivery to the Ammonia Injection Grid of an SCR system. ●In-situ conversion of urea to ammonia in the hot exhaust gases of an internal combustion engine, combustion turbine, flare, or incinerator. ●Retrofit application of existing, hydrolyser-vessel-type, urea to ammonia reactors. ●In-Situ conversion of urea to ammonia in Power Boilers for SNCR purposes. ●In-Situ conversion of urea to ammonia in a Cement Kiln for SNCR purposes. ●In-Situ conversion of urea to ammonia in a Fluid Bed Combustor for SNCR purposes. ●External conversion of urea to ammonia for corrosion protection in certain SNCR systems. Patent Pending Approach utilizes direct application of high temperatures to dry urea or urea solutions. The source of heat can be from steam, hot air, or electricity. Corrosion. The pressure vessel shows internal pitting above the water line. The oxidized material settles to the bottom of the vessel and accumulates. This sludge contains chromium and other heavy metals which then becomes a waste disposal issue. Heavy Liquid Accumulation. Partial urea decomposition products combine with themselves or with whole urea to form heavy nitrogen-containing compounds - which do not easily break down at the typical 300 degF operating temperature of the vessel. The result is a slow and steady increase in liquid phase Specific Gravity. Black Sludge. The compounds discussed in the previous item can be entrained in the gas phase and carried to down stream piping, AIG, and catalyst. Extra heat trace and insulation can help avoid cold spot condensation, but is far from solving the problem. Instrumentation Failure. The oxidized iron causes magnetic level instruments to stick. The highly corrosive liquid in the vessel destroys DP cells. There is no known cure for these fundamental process flaws.